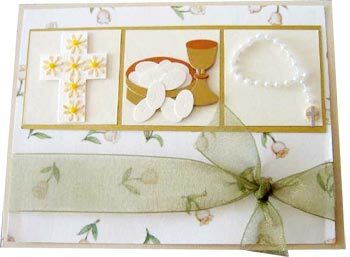 Making invitations for yours or your family members first holy communion is a nice way to welcome your guests to be a part of this milestone event. 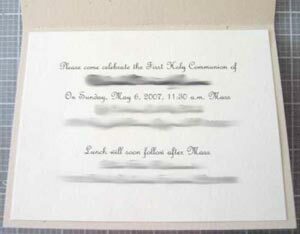 Make you won homemade communion Invitations with white cardstock decorated with gold or silver embellishments. Organdy ribbon in contrasting colors are very appealing and will compliment nearly any invitation design. The cardstock used for the base card was a white card with a tulip flower pattern. The paper was recycled from my scraps left over from about 10 years ago when I was putting together my parents wedding scrapbook. I just wanted to do my best and to use up as many of my scraps as much as possible. You can use any type of patterned paper but I do recommend a white background. Textured or embossed white card would look beautiful. The communion embellishments were from Jolee's Boutique stickers. The cross and rosary-like necklace sticker type embellishments and were purchase from JoAnn's Crafts Essentials.